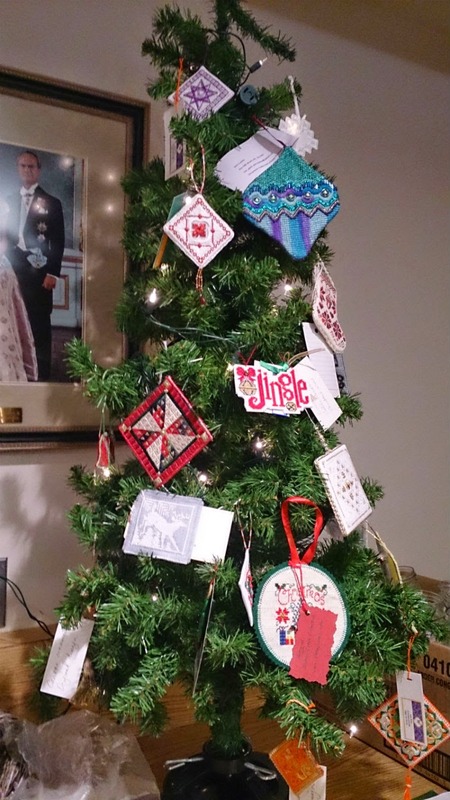 Stitchers from across Canada could stitch a winter ornament and send it to one member who then sends them all back out to different addressees. When was the last time you received more letters than bills? Over the past four months I have received mail from across Canada for the 2014 Christmas Winter Ornament Exchange and it has been wonderful. I received 29 envelopes in total in the mail with another five members from my Calgary Guild of Needle and Fibre Arts participating. Due to a number of stitchers sending more than just one ornament the total number of ornaments came to 50. The first ornament I reeceived was from Kim Beamish back in July and my last was from Sheila Stewart which had to come all the way from Nova Scotia. I received many different styles of needlework including canvas, hardanger, cross-stitch, blackwork, beadwork, battenburg lace and backstitch. I really wish I could’ve kept them all but on Sunday 23 November I sent them all out again to different addressees. A big thank you to all the stitchers who participated. I hope you will continue to participate in the future and I hope that next year even more stitchers will join in the fun. I’ve enclosed a couple of photos so you can see some of the lovely ornaments.